Yes, the Summer Sweeps will be back in 2019, and it will be our best year yet! Stay tuned for details. "I'm delighted to have won the grand prize and I'm thrilled to know that I'll be working with CMS Global Travel to book a family vacation." See full list of participating merchants (21 stores and businesses). View the list of prizes. 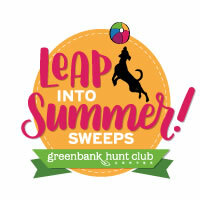 For a complete list of rules and regulations, please visit the Summer Sweeps rules page. Congratulations to Richard M. Haney, Ph.D., the winner of a private dining experience for 10 at Salute Italian Kitchen & Wine Bar (max value $1,000). Richard said: "I am so happy to have won the Grand Prize at Greenbank Hunt Club Centre!! How appropriate. We are having a discussion-based gathering called 'What Matters Most' and it will be delightful to hold it at this wonderful Italian restaurant."